It was so cold, customers would run past those of us outside and head into the warmth of the building. But we foxes are resourceful creatures. When life gives you lemons, make lemonade. Or in our case, when you have to rent a propane heater to stay warm and keep your customers happy, you toast marshmallows! 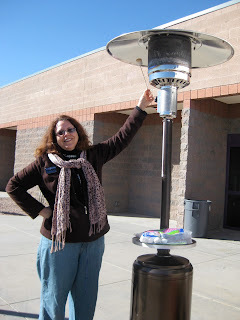 Here's Joy hard at work toasting a marshmallow on our "Bronze Heater". It was a conversation starter and a treat for those brave customers stopping at our booth.